It’s National Chimney Safety Week, and we at the Chimney Safety Institute of America are sounding the alarm about scammers who may try to prey on consumers’ lack of expertise when it comes to chimneys and how they operate in your home. As winter approaches, so do scam artists trying to take your money for chimney-cleaning services they are not trained to provide. Today is the second of the four most-common scams that we’ll be spotlighting here at the blog this week. Let’s be honest. You can probably point to your fireplace chimney from the exterior of your home. 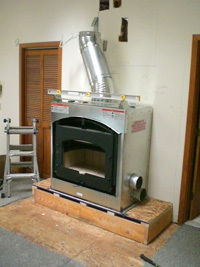 Maybe you can locate the other chimneys connected to your furnace or home heating system. Aside from that, what do you really know about the chimneys in your home? They allow for the release of dangerous gases from your home. Okay, you know that, too. But as to the inner workings of your chimneys and knowledge of what does or does not constitute potentially serious hazards, you are at the mercy of the professional you bring to your home for an annual inspection. It’s just these circumstances that scammers will exploit. Be wary if a “professional” chimney sweep attempts to stoke your fears with claims that specific, extensive repairs must be made immediately to keep your family safe. Should an inspection reveal the need for any kind of repair work, the rule of thumb is to collect at least three estimates (with documentation) before you make a decision about big-ticket repairs. And be sure that your estimates are coming from local companies with CSIA Certified Chimney Sweeps on staff.